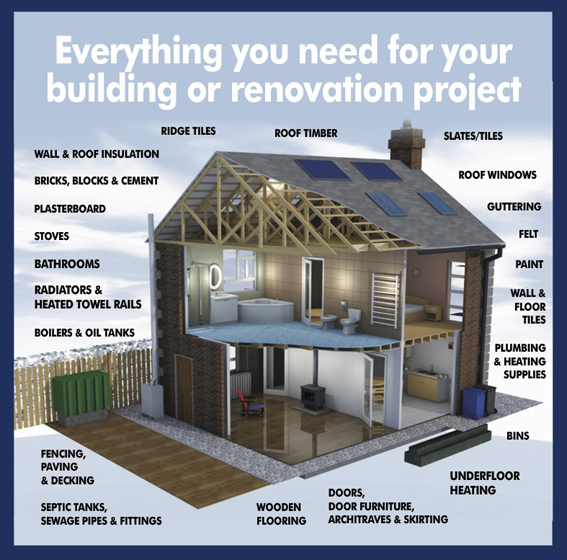 Whether it is you are building your dream home or undertaking an extension or a refurbishment, BJ Mullen can help. With step by step advice, we can supply all the products you will need for your project from foundations to roof tiles and everything in between. Our self build experts, together with our credit and accounts team will help run your successful build. We provide expert advice covering all aspects of your project to ensure that all elements have been budgeted for and our accounts team provide itemised monthly statements and invoices. We can also liaise with your bank or mortgage provider to ensure stage payments are drawn down on time and keep the build schedule on target. As well as assisting others in build projects, the majority of our staff has also built or renovated their own homes. We believe that this experience is what makes our self build service stand out from the rest.